Two things that Professor Ian Plimer confidently touted during his presentation at the SA Skeptics annual conference was (1) the relevance of David Evan’s so-called missing tropical hotspot (as supposed proof against greenhouse theory) and (2) that sub-sea volcanoes along the Gakkel Ridge is likely to be the cause of accelerated melting of the Arctic summer sea ice. So what is the latest scientific opinion on these? Using state-of-the-art observational datasets and results from a large archive of computer mode simulations, a consortium of scientists from 12 different institutions has resolved a long-standing conundrum in climate science – the apparent discrepancy between simulated and observed temperature trends in the tropics. Research published by this group indicates that there is no fundamental discrepancy between modeled and observed tropical temperature trends when one accounts for: 1) the (currently large) uncertainties in observations; 2) the statistical uncertainties in estimating trends from observations. These results refute a recent claim that model and observed tropical temperature trends “disagree to a statistically significant extent”. This claim was based on the application of a flawed statistical test and the use of older observational datasets. The bottom line is that we obtained results strikingly different from those of Douglass et al. The “robust statistical test” that they used to compare models and observations had at least one serious flaw – its failure to account for any uncertainty in the “signal component” of observed temperature trends (see QUESTION 7). This flaw led them to reach incorrect conclusions. We showed this by applying their test to randomly generated data with the same statistical properties as the observed temperature data, but without any underlying “signal trend”. In this “synthetic data” case, we knew that significant differences in temperature trends could occur by chance only, and thus would happen infrequently. When we applied the Douglass et al. test, however, we found that even randomly generated data showed statistically significant trend differences much more frequently than we would expect on the basis of chance alone. A test that fails to behave properly when used with random data – when one knows in advance what rresults to expect – cannot be expected to perform reliably when applied to real observational and model data. Go read the whole thing (there are 10 frequently-asked-questions answered in all). Then there is question of the influence of those sub-sea Arctic volcanoes. Could they possibly be the cause of the melting surface ice, due to a slow diffusion of heat from the ocean floor, many kilometres deep, to the surface waters? (and, one presumes, a recent increase in volcanic activity). NY Times investigative journalist Andy Revkin handballed this question to his extensive scientific contact list, to get a decent spread of informed answers. The response on this issue, by 7 different scientists who work in this area, is an unequivocal NO! I’ll quote a couple below, but I suggest you read the two posts by Revkin on this issue, here and here, for the full story and links. It occurs to me that we have primary evidence that heat from the bottom is not reaching the ice. Temperature profiles from virtually everywhere in the Arctic Ocean display a maximum temperature at a depth from 200-400 [meters]. This is associated with the Atlantic Water entering the basin from the Norwegian Sea. Fundamental laws of physics require that below the depth of this maximum, the heat flux is downward. Very near the bottom temperatures have been found to increase with depth indicating a small upward heat flux from geothermal sources, which help to heat only the very deepest water. The heat flux above the Atlantic temperature maximum is upward. The rate of this flux of Atlantic Water heat flux is variable depending on depth of the maximum and overlying stratification (stratification is controlled by salinity in the Arctic Ocean). Treshnikov estimated it from Atlantic Water heat content to be a couple of Watt/m2 in much of the Euarasian Basin. It is smaller farther from Fram Strait and greater near Fram Strait. How this flux changes is potentially very important to the ice cover. Changes in geothermal heat flux are not. In 2001, the volcano at 85E was still erupting explosively, although in a less vigorous mode (Schlindwein et al., GRL, 2005). The associated event plume in the water column is well surveyed and described in Edmonds et al. (Nature 2003). That plume of relatively “warm” water – temperature anomaly less than 1/10 degree – reaches a minimum water depth of about 1700 m, its center being around 2500 m water depth. These data make it very evident that the sea ice is not influenced by the heat released from the ongoing eruption. So, two more sceptical questions bite the dust. But I wonder if Ian Plimer, David Evans, Fred Singer and others who have put store in these theories, will pay any attention? Plimers argument is flawed in that the buffering reactions may be fast, but the ocean mixing is very slow. Ocean buffering does occur but only on a time scale of 1000s of years. See Techniques – Fire+Ice: Exploring for Volcanoes Beneath the Arctic for a nice 1-page description of ways they look for plumes, and actually, that they are hard to find, because they just aren’t that hot! Not while people over at Jen’s blog still are denying the greenhouse effect. I dropped in for a look after 3 months or so and the Douglass paper is still the benchmark for deniers. Good point Steven Hill @4: I also addressed this question in CCQA #2 (and see slide #41). So regarding Ian’s argument on rocks absorbing CO2 – it’s correct, and yet not relevant to the current crisis, since the time scale for uptake of the current pulse of CO2 is on the order of 100,000 years to reach equilibrium. Between then and now, we have acidic oceans as the geochemistry slowly works its wonder. A good example of mixing geological and human/species time scales. One time in the deep past when we had rapid change in CO2, it did turn into sludge (at least partly), 55 million years ago during the Paleocene Eocene Thermal Maximum. It is not concentration of CO2 that does it, it is the rate of change from one state (low CO2) to another (high CO2) – takes time to balance the chemical reactions via ocean mixing rates. The CaCO3 in slide 41 is the calcite concentration – you can see the drop (acidification) and recovery. It takes about 100,000 years (1 increment on that graph) to recover (mostly done in about 50,000 years – fast geologically, but still hideously slow for humanity…). Basically contrarians rely on the still widespread ignorance of many in the public (the swinging voter?) who would swallow such nonsense as “global warming is due to heating of the Earth core” or “warming of the planets” … Some contrarians who have argued for years tobacco smoking is safe … perhaps they should be asked whether they still believe there is not connection between smoking and cancer? The next sunspot cycle has started again too – so much for David “new ice age” Archibald. Actually if Christy and co. were correct about atmospheric warming, we’d expect a higher climate sensitivity. TARA BROWN: They may not be as well known but there are many scientists – in fact thousands around the world – who don’t think carbon dioxide is the climate-change culprit. Scientist and mathematician, David Evans, says man is not to blame and so to cut carbon emissions is misguided. DAVID EVANS: I think it’s an utter waste of time and that’s why I’m speaking out. The picture that our decision makers have is wrong. It’s going to cost us a lot of time, effort and money and it’s gonna make a lot of us a bit poorer and there’s no evidence that carbon emissions cause any significant warming at all. TARA BROWN: No doubt the ice is melting, but the big question is – are we to blame? The United Nations Intergovernmental Panel on Climate change reports it is 90% certain we are. But other equally eminent scientists believe what were seeing is just part of Nature’s great cycle. DAVID EVANS: Now since 1990, western governments have spent about $50 billion looking for evidence that carbon causes global warming and they haven’t found any. TARA BROWN: Dr David Evans has six university degrees and once worked for the Australian Government’s Greenhouse Office. But he no longer thinks global warming is caused by our carbon dioxide and so isn’t concerned about his or any one else’s carbon footprint. So does that mean don’t give up your V8 cars? Does that mean continue flying, don’t worry about changing light bulbs, don’t worry about trying to capture carbon or shutting down coal-fired power stations? Is that what that means? DAVID EVANS: Well, I’m just here to report on modern science and where it’s up to, personally I don’t worry about those things too much, no. TARA BROWN: And what we should know, according to David Evans, is since 2001 temperatures around the world have stopped rising. And that’s despite increasing levels of carbon dioxide in the air. So statistically, in the last seven years, the flattening and perhaps even slight cooling of temperatures – is that significant? DAVID EVANS: Yes, yes it is significant. Once it gets up to five years or so it’s really quite significant. Whatever was driving the temperatures up has taken a break for a while and meanwhile carbon emissions have continued and the level of carbon in the atmosphere has gone up about 5% since 2001, yet we see no more warming. TARA BROWN: Global Warming certainly attracts lots of argy-bargy. But one thing climate scientists agree on – if global warming is caused by CO-2 emissions then the CO-2 will leave a distinct signature their computer models predict a big red hotspot above the equator. The problem is thousands of weather balloons equipped with some very sophisticated thermometers have measured the temperatures in the atmosphere to test the theory, and guess what, no hotspots. DAVID EVANS: There’s no hotspot, there’s no hotspot at all. It’s not even a little hotspot and it’s missing. We couldn’t find it. TARA BROWN: So, this is the crux for you, this is evidence? TARA BROWN: A very simple question, is there any chance you’re looking in the wrong spot? Lots of denier arguments coming to the fore in David’s justification and positioning. For a scientist of his stature I find it more than a little disconcerting. I’m both glad and sad to see there is evidence to refute mavericks like David. I have read with interest the paper by Santer et al indicating that the statistical work by Douglass et al is flawed because they had not allowed for natural random noise in the data set of measurements in upper tropospheric temperatures. This would quite obviously introduce wider uncertainty in the negative correlation between results of measurements and models. However, I could not find any demonstration by them that the data, corresponding as it does to some 35 years of measurements, provided any evidence that the warming increases predicted by the models was in fact observed. The paper seemed only to concentrate on showing that there was no discrepancy because of the large uncertainty. Given the large uncertainties in the model input parameters as documented in Chapter 8 of the IPCC FAR 2007, the fall in the effective global temperature as published by the Hadley Centre and GSS for 2007/2008, which was not predicted by the models, why are there no definitive studies being made of other model predictions to verify their accuracy? Is it true that the Norwegian explorer Nansen kayaked to within 560 km of the North Pole in 1893 while the recent attempt by Lewis Pugh from England saw him complete his journey while still 900 km away from his destination? These reports including that by Santer et al, highlight the need for more scientific measurements to be made to support the findings of the computer models. These two quotes are quite telling — the fact that you don’t pick up on the biases exhibited by these “scientists” show how biased you are. Their arguments are based on an appeal to authority and replacement of reality with model-generated outputs. Also, regarding subsea volacanic eruptions — a volcanic eruption involves release of magma at several thousand degrees C plus superheated gases — when that hits cold sea water you are going to have a very violent and explosive change of form from lquid water to steam combined with the release of dissolved gases (mostly CO2) — I am not sure what laws of Chemistry and Physics you are looking at, but I would suggest that that those bubbles and heated gases and water will rise to to the surface very quickly and have a major local effect on any nearby ice. Dismissing undersea volcanic eruptions out of hand and claiming that heat will be dissipated with minimal effects clearly shows the intelellectual arrogance of this person. 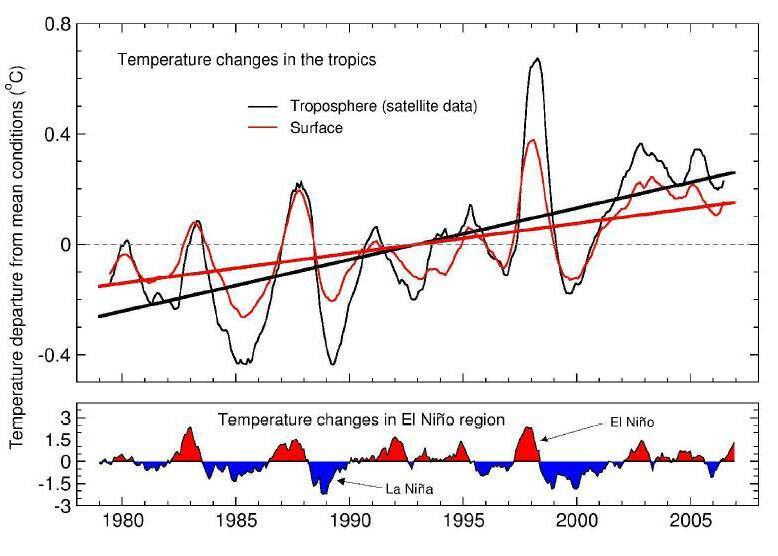 These so-called refutations of Ian Plimers claims are based on propaganda techniques which are commonly used by fundamentalists and true-believers, not by real scientists. My opinion is that you are wrong on CO2 — producing CO2 is a benefit to all life on Earth — we are after all carbon based life and all that carbon (directly or indiectly)comes from CO2 via photosynthesis. The idea that laws can be passed which will determine the climate is ludicrous. I think we should be lowering the costs of energy production to improve the wealth of all peoples. There are lots of economic natural gas and oil reserves waiting to be developed and nuclear power plants which could be built if artificial restraints and overbearing regulations were reduced. PS: So, how many years of ‘global cooling’ before you rethink CO2 as the driver of climate? With hindsight, you were completely wrong there. A scientist of his stature? I thought David Evans was a computer programmer. When did he ever work as a scientist? Maybe there are two David Evanses and I’m gettting them mixed up. I get a chuckle reading & listening to the minor points you environmentalists find to debate. Plimer may not have every little item correct…. no scientist does…. but you never dare to take on the really large scientific data that point to climate as an ever-changing natural occurrence. Where’s your critique of the earth’s wobbly orbit that occasionally takes us a bit closer to the sun? How about addressing the scientific fact that CO2 is liberated from the oceans by warming… and it takes centuries for CO2 to rise (a fact that seems to have escaped Al Gore)? Where is your attempt to show that the so called global temperatures have been cooling for over a decade? What about the “coincidence” that relates sun spot activity to warming and cooling cycles on earth? Plimer stands in a group of outstanding scientists, including Professors John Christy, Paul Ricard, Ian Wilson, Stephen Schwartz, etc. that have pretty much destroyed the so called logic you seem to support. Canadian climatologist Tim Patterson says the sun drives the earth’s climate changes—and Earth’s current global warming is a direct result of a long, moderate 1,500-year cycle in the sun’s irradiance. CO2 variations show little correlation with our planet’s climate on long, medium and even short time scales. What bugs me is the suspected millions of submarine volcanoes, guesstimated 39,000 over 1000 mtrs, surface activity increasing so likely submarine activity increasing, plus the heat from the rifts where they exude magma, where does the heat go? Is it carried to the surface by the great conveyor or the local eddies it was recently demoted to? If it makes it to the surface, it would amplify the temperature of the poleward flowing current from the equator surely? Also, my memory may be playing tricks but wasn’t a recent strong eruption observed to defeat the inversion barrier? “So a vast system of undersea volcanos, that is erupting constantly, absolutely cannot have an effect on the planet’s geo-physics but man’s activity is the primary driver? Hey Clothcap, hasn’t undersea geothermal activity been (relatively speaking at least) a constant? Something that has been occurring for countless millions of years? Unlike industrialisation, which is a new factor? Seems obvious to me that a new factor will have a new effect, that a constant doesn’t.